Hi TreeHouse friends – The sun and warmth are with us once again! Our summer hours are in effect from May 1 through August 31. See our Location & Hours page for the details. It’s Chelsea Fair week! We are super excited that the Chelsea Fair is here once again from August 19-23, 2014. During Fair week we will be open our regular hours, with the exception of Wednesday when we’ll close at 5pm. Stop by the TreeHouse for a comfy chair, cool drink and healthy food while you’re in town for the Fair! 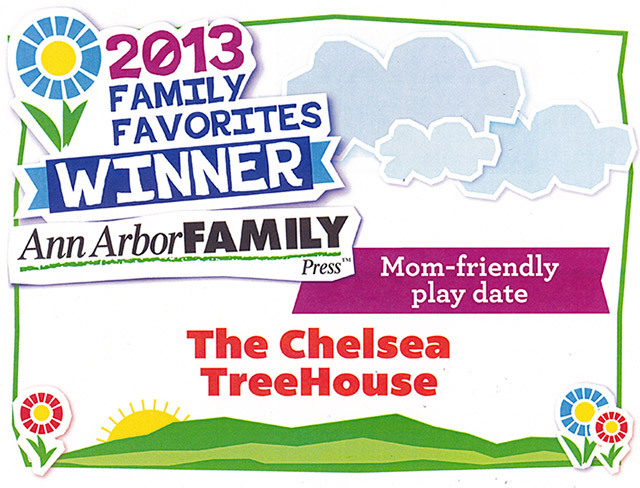 Thanks to Ann Arbor Family magazine, the Chelsea TreeHouse has been voted “Best Mom-Friendly Playdate” location! With our great coffee, tasty snacks and lunches, clean facilities and helpful staff, we are very proud to cater to moms’ needs and worries. Thank you to everyone who voted!